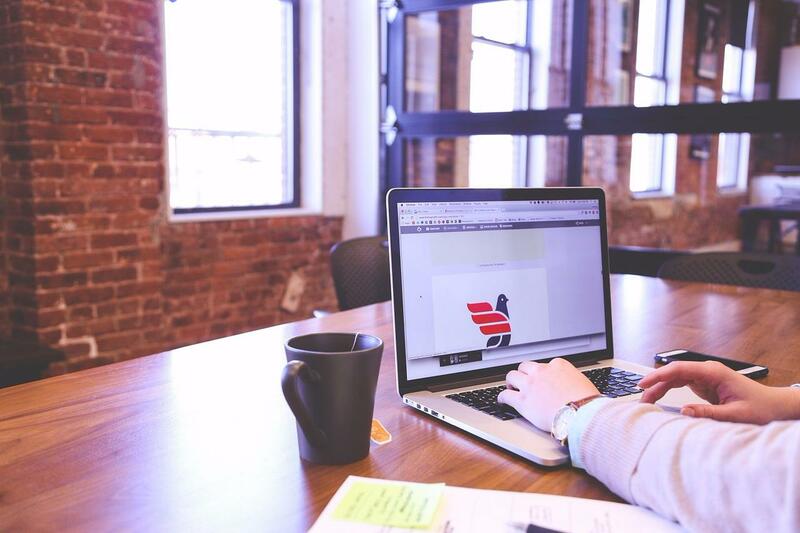 Create a beautiful website that captures your donors’ attention with no tech skills needed. A range of nonprofit best practice templates. Easily customize a range of templates designed with nonprofit best practices in mind. Optimized webforms. Pre-built donation, membership, event registration, and other forms are designed to increase conversion. Nonprofit CRM integration. Automatically collect data you receive from your webforms in new or existing donor profiles. Website strategy and unlimited support. Our templates come with the added benefit of web design consultation and unlimited tech support. Inspire is more than a template; it’s a service! Our DIY Inspire package starts at only $90/month. Click here for more pricing information. One of the biggest benefits of Inspire is that it can be integrated with your nonprofit CRM for seamless data collection. Plus, you’ll be working with a developer who can provide you with unrivaled support. Here at Neon, 90% of our staff come from a nonprofit background, so we’re in tune with your needs and concerns. Give me the free Inspire demo! Sermons manager. 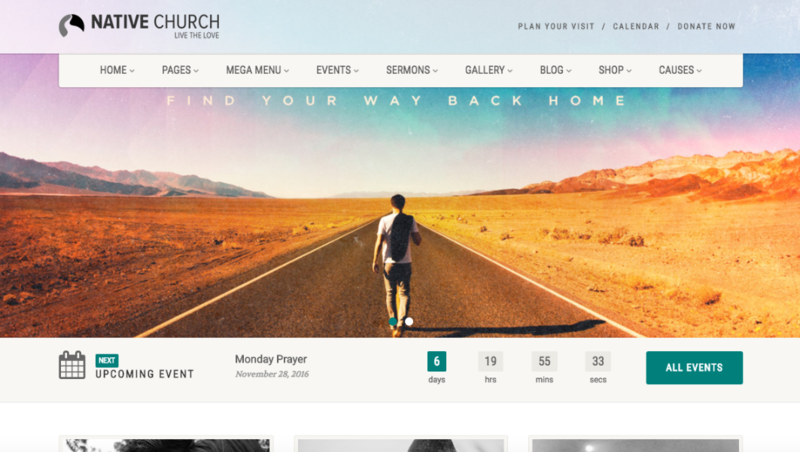 The theme has a unique sermons manager feature that enables churches to create and upload multimedia sermons right on their websites. Built-in donations portal. NativeChurch’s template includes a donations portal where churches can accept and track tithes. 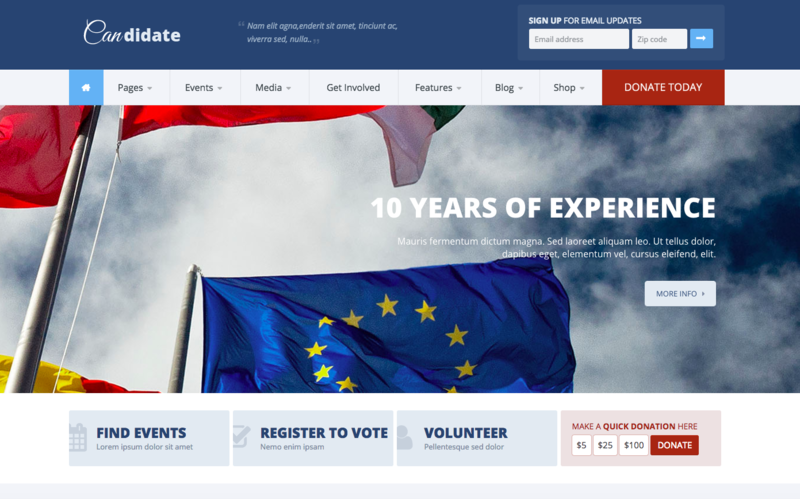 The theme has also been fully translated into 20 languages, making it great for international nonprofits. The template starts at $59 for a regular license. 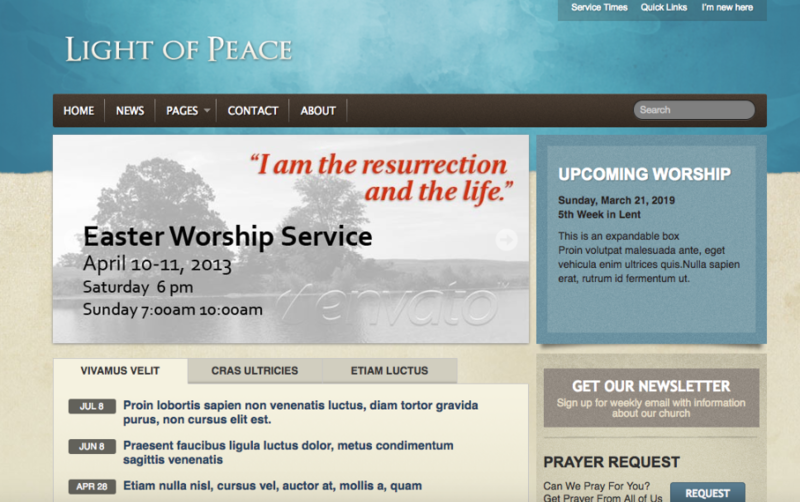 The NativeChurch template has a few unique and useful features. Some of the most notable include a sermons manager (mentioned previously) and an events manager, which allows nonprofits to create event registrations and manage RSVPs right through their websites. Pop-out windows. You can feature service hours and directions in a pop-out window plug-in so new visitors will be able to find important information quickly. Multiple page templates. The Light of Peace template includes 7 separate pages to help you build out multiple pages on your website. The main downside to the Light of Peace theme is that it’s built with HTML and not a website builder (like WordPress), so maintenance requires coding. The Light of Peace template starts at just $14 for a regular license. The Light of Peace template includes 7 different pages, 4 color schemes, and a font replacement feature, giving churches and nonprofits plenty of customization options. You can tweak the template to fit your unique brand and needs so your website is reflective of your organization. Responsive design. The Sport template uses responsive design, so it looks and functions great on any device. It even includes a side swipe navigation designed specifically for mobile devices! Lots of customization. The template includes 45 HTML page templates, multiple gallery styles, unlimited color variations, and 400+ icons to choose from. The template is also SEO optimized and comes with a Google Analytics plug-in to help organizations stay on top of their page performance in search rankings. The Sport HTML template starts at $20, the WordPress template at $64. The Sport template is highly customizable and flexible, enabling nonprofits to achieve a range of looks that reflect their unique brands. It also supports many different media types such as videos, blog content, newsreels, and more to help nonprofits engage their supporters. Sign me up for an Inspire demo! Lots of customization. Your organization can choose from 10 color schemes, 13 homepage layouts, 7 header styles, and more. Slider features. The Lifeline template includes a unique slider feature, allowing organizations to bring their pages to life by selecting different animation styles. Plus, their templates are guaranteed to be responsive so supporters can access an intuitive website on any device. The Lifeline HTML template starts at $18, the WordPress template at $69. Lifeline’s minimalist layouts look fresh and modern and can be adapted for all sorts of looks. Plus, they offer both HTML and WordPress options, catering to nonprofits at varying levels of technical proficiency. Slide jump features. Jump Eco’s name derives from their unique slide jump feature, which scrolls down to a selected menu item in one smooth scroll, instead of jumping to to a different page. Built-in donation capabilities. Jump Eco’s template includes a built-in transaction form where you can accept donations and other contributions. Keep in mind that this template is built using HTML, so your organization will need a basic understanding of coding to customize it. A regular license for the Jump Eco template costs only $20. Jump Eco’s unique one-page layout and slide jump theme is perfect for nonprofits who desire simplicity and wish to keep their websites minimal. It also includes additional animated elements, like graphics, to help your organization’s website stand out from the crowd! Over 45 pre-built pages. Candidate comes with a whopping number of pre-built pages designed for a range of needs, including 3 homepage templates. Events calendar. This template has a user-friendly event calendar feature, where supporters can easily browse upcoming fundraising events. The template also offers touch-enabled content slider features, mobile-responsive design, and more. The Candidate theme is priced as follows: $18 HTML, $59 WordPress, $58 Drupal, and $10 Photoshop. Candidate offers nonprofits an incredible amount of variety and flexibility. Not only can you customize the theme using multiple different platforms, but also you’ll have plenty of features available to tailor your website to your needs. Multiple cause layout. With Charity, you can select either a single or multi-cause layout, allowing your organization to highlight all of the causes that are important to you. WooCommerce portal. If your organization is selling products to help raise money for your cause, you can easily set up an online marketplace with Charity’s commerce page templates. The Charity WordPress theme also includes a donation portal powered by Stripe, a visual composer that provides additional features, customization options, and more. The Charity WordPress theme costs $49, the HTML $21. From donation portals for multiple causes to product marketplaces to event manager plugins, the Charity template makes fundraising for your cause easy. Not to mention, it was designed to bring your cause to the forefront so that supporters will know what your organization is about from the moment they land on your site! Check out 22 tips for amazing nonprofit web design. See stellar website examples from nonprofits like yours. Compare the top nonprofit web design firms. Evaluate the top nonprofit website builders. Show me why nonprofits love Inspire websites!